A gorgeous gift to celebrate your love for that special someone. This beautiful, romantically themed silver coin reflects the growing phenomenon of “love locks”. In many cities around the world, bridges are covered with tiny padlocks, attached by loving couples who leave their love "locked" and preserved. This beautiful 99.99% silver coin is meticulously engraved with a heart-shaped padlock that is ready to be unlocked by the special person who holds the key. The key depicted on the silver coin holds three Swarovski® crystals, adding a joyful sparkle to this celebration of love. Behind the lock and key sit selectively colored roses, the universal floral symbol of love. Made by the Royal Canadian Mint, the 2018 Celebration of Love pure silver coin is encapsulated and comes in a beautiful custom keepsake gift box. Order this unforgettable gift that says “You hold the key to my heart” from Kitco today! For other truly unique gift ideas for Valentine’s Day, Mother’s Day, Father’s Day, graduations or birthdays, please visit Kitco’s Gift Ideas! 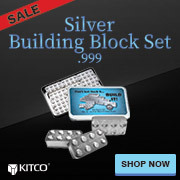 Why buy 1/4 oz Silver Coin - Celebration of Love from Kitco?